This dish epitomizes the sweet and sour dishes of China. It is made from fresh pork ribs, which appear shiny and red after being cooked. The sauce is finished with lime juice and butter; this twist reflects the innovative style of Hong Kong cooks. 1. 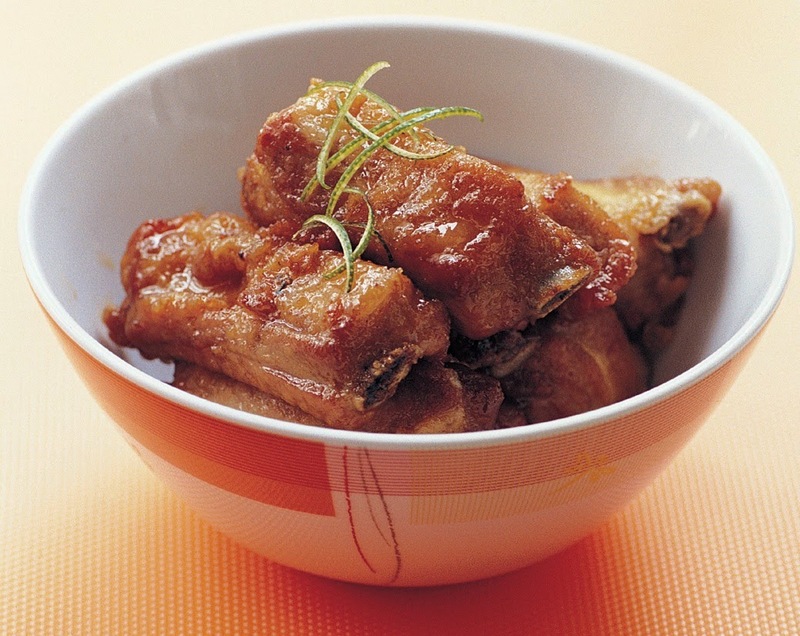 In a large bowl combine ½ teaspoon of the salt, the sugar, cornstarch, rice wine, soy sauce, and the ½ teaspoon oil. Add the spareribs and combine. Marinate 1 hour. Pat dry completely with paper towels. 2. Heat a flat-bottomed wok over high heat until a bead of water vaporizes within 1 to 2 seconds of contact. Swirl in the remaining 1 tablespoon oil and add the spareribs meat side down, spreading them in the wok. Reduce the heat to medium and pan-fry undisturbed 5 minutes, letting the spareribs brown. Then, using a spatula, turn the spareribs over and pan-fry an additional 2 minutes. 3. Add the brown sugar, vinegar, and the remaining ½ teaspoon salt with 1/3 cup water to the wok and bring to a boil over medium-high heat. Turn the ribs meat side down. Cover, reduce the heat to low, and simmer 1 to 1½ hours, until the meat is tender. Add the butter and lime juice and stir to combine. Garnish with lime zest if desired.